Tempro-Mandibular Joint Dysfunction Syndrome (TMJ) is a common condition affecting a wide variety of people. TMJ is characterized by headaches, jaw pain of varying degrees, grinding teeth, and in advanced cases an intermittent ringing in the ears. The vast majority of TMJ sufferers are unaware that the main reason of these problems is something that your dentist can effectively treat. The symptoms of TMJ can be debilitating and can greatly interfere with daily life. The comfort and general well being of the patient is at the heart of our dental practice, so pain relief is our first consideration. We are able to test, diagnose, and devise an immediate plan to treat the underlying causes of the TMJ disorder. TMJ sufferers report that their symptoms generally worsen during periods of prolonged or unexpected stress, and that intense outbreaks of the condition can lead to neck and jaw pain, and tooth sensitivity. The most common cause of TMJ is the misalignment of the teeth, “bad bite.” It is possible for the dentist to realign or adjust the teeth without the need for painful or expensive surgeries. The realignment/adjustment can stop the pounding headaches, the jaw pain, and the dizziness. The grinding teeth symptom is particularly common and usually occurs at night. The grinding will eventually erode the structure of the teeth and lead to much more severe dental problems in the future. Untreated TMJ is one of the underlying factors in losing dental alveolar bone, bone that is around your teeth, and loose teeth. TMJ could be a result of several different problems. Bad bite is the most common, but an injury resulting from a blow to the meniscus cartilage is also a possibility. Initially, we will thoroughly examine the jaw area, the patients bite, take x-rays, and review the patient’s history in order to make an accurate diagnosis and recommend necessary treatment. 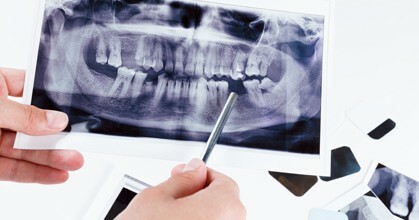 Once a firm diagnosis is attained, there are several ways in which relief can be provided. A specially molded bite guard can be created to stop teeth grinding during the night. A bite relationship analysis may be recommended where we can recommend a dental orthotic appliance to help position the patient’s teeth in an ideal position that will help reduce the clenching and grinding also can help with the muscle aches that are created by this condition. We can also provide advice on relaxation techniques, which will lessen the effects of stress. As a last alternative, we are also able to prescribe muscle relaxants. Another option is to change the shape of the teeth and get rid of the “bad bite” completely, often called “realignment.” This is especially useful because it alleviates TMJ symptoms and may improve the esthetic appearance of the teeth as well. Realignment involves adjusting the relationship between how the upper teeth come together with the lower teeth. This may require new restorations and/or adjusting the natural teeth as well. It is not a painful procedure, and it is one that we have performed with great success numerous times. As with any procedure, we will be happy to answer questions and discuss symptoms, options, and treatments.